Exeter is a City, and the County Town of Devon England and is located on the River Exe approximately 37 miles north east of Plymouth and 70 miles south west of Bristol. Exeter has a long history being founded by the Celts and established by the Romans in 50 AD as Isca Dumnoniorum and it was the most south westerly Roman fortification settlement in Britain. Exeter has been a City since time immemorial and has an imposing Anglican Cathedral founded in 1050. The City still retains many of its historical landmarks, together with the Cathedral and much of the original Roman wall still stands. The Guildhall is the oldest municipal building in England which is still in use. One of the famous streets of Exeter is Parliament Street which is the narrowest street in the United Kingdom where two people cannot easily pass each other. 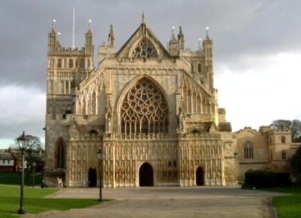 Tourism is a vital part of the City economy and in 2004 Exeter was granted Fair Trade City Status. The City has been identified as one of the top 10 most profitable locations for a business to be based in England with a catchment work force of some 300,000 people within a 45 minute drive and has a sizeable service economy, including the Met Office (the main weather forecasting organisation in the United Kingdom) which relocated from Bracknell in Berkshire to Exeter in early 2004. This is one of the three largest employers in the area. The others being the University of Exeter and Devon County Council. The City has good transport links with the M5 motorway system, two mainline railway stations, together with an International Airport which connects the City both nationally and internationally. The education facilities in Exeter are wide and varied and include the University of Exeter which has two campuses in the City and is one of four sites for the University of Plymouth. Other further education also includes the Peninsular Medical School and Exeter College which is a major College for further education. In addition to this, Exeter School, is one of the oldest of several public schools in the City along with an abundance of recently refurbished public sector schooling. There is an abundance of local sporting facilities and recreational facilities along with many forms of entertainment in the forms of theatres and cinemas. Exeter, although being a City, still has the feel of a market town and has one of the lowest recorded reports of crime for a City in the UK. It is a delightful place not only to visit but more importantly perhaps considering for relocation. Search our database of properties for sale and rent in Exeter.